The MTF survey measures drug and alcohol use and related attitudes among 8th, 10th, and 12th grade students nationwide. Survey participants generally report their drug use behaviors across three time periods: lifetime, past year, and past month, with regular or daily use being reported for some tobacco products and marijuana. Results from the survey are released each December. For the latest survey results, visit drugabuse.gov/related-topics/trends-statistics/monitoring-future. The Substance Abuse and Mental Health Services Administration’s (SAMHSA’s) NSDUH (formerly called the National Household Survey on Drug Abuse) is the primary source of information on the prevalence, patterns, and consequences of alcohol, tobacco, and illegal drug use and misuse and mental disorders in the U.S. civilian noninstitutionalized population, ages 12 and older. For more survey information, visit www.samhsa.gov/data/data-we-collect/nsduh-national-survey-drug-use-and-health. The TEDS system, maintained by SAMHSA, is a national census data system that includes records for substance use treatment admissions and discharges annually for clients ages 12 or older. While TEDS does not represent all substance use treatment activities, it comprises a significant proportion of all admissions and discharges to substance use treatment programs. Data collected by states include: demographic information; primary, secondary, and tertiary substances and the usual route of administration, frequency of use, and age at first use; source of referral to treatment; number of prior treatment episodes; service type, including planned use of medication-assisted opioid therapy. For more information, visit https://wwwdasis.samhsa.gov/webt/information.htm. NDEWS began in August 2014 and is supported through a Cooperative Agreement award to the University of Maryland. NDEWS builds on and expands beyond the former NIDA Community Epidemiology Work Group by creating a broader network, adding a national perspective, and incorporating innovative approaches for the identification and monitoring of emerging drug problems. NDEWS has established the NDEWS Network, a virtual community of scientists, government officials, public health experts, law enforcement representatives, and others for sharing information and assisting with local research. Innovative methods being developed for information collection include scanning social media and news media, developing a collaboration with the American Association of Poison Control Center, and conducting site visits to local communities experiencing emerging drug problems or changes in drug use trends. For more information, visit drugabuse.gov/related-topics/trends-statistics/national-drug-early-warning-system-ndews. The YRBS, part of the Centers for Disease Control and Prevention’s (CDC’s) Youth Risk Behavior Surveillance System, consists of national, state, and large urban school district surveys that collect data from students in grades 9 through 12. The surveys are conducted every two years and include questions on a wide variety of health-related risk behaviors, including substance use. For more information, visit www.cdc.gov/healthyyouth/data/yrbs/index.htm. CDC's Wide-ranging Online Data for Epidemiologic Research (WONDER) is a web application that makes many health-related data sets available to the worldwide public health community. Among many other things, it provides information on drug overdose deaths in the United States. For more information, visit wonder.cdc.gov. A wealth of material about drug use and addiction is available, free of charge, from NIDA. Through its online and mobile presence, NIDA strives to communicate its research findings to the wide-ranging audiences it serves, which include students, parents, teachers, researchers, scientists, prevention and treatment practitioners, healthcare professionals, policymakers, constituent groups, children and teens, underserved populations, and the general public. Most resources are available on NIDA's website: drugabuse.gov. The site’s responsive design allows people to access the information on handheld devices and to order a free hard copy of some resources. 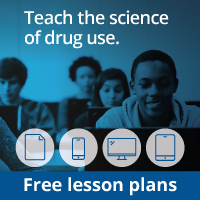 For specific information on NIDA news releases, video, infographics and animations, podcasts, latest news, public education projects, and other additional resources for the media resources, visit the News & Events Page at drugabuse.gov/news-events. NIDA summarized data from the Centers for Disease Control and Prevention (CDC) and IMS Health to create a database of opioid use and consequences of use in each of the fifty states and the District of Columbia. To learn more visit drugabuse.gov/drugs-abuse/opioids/opioid-summaries-by-state. NIH is the steward of medical and behavioral research for the Nation. NIH.gov is a portal to sites representing 27 institutes and centers at NIH. NIH’s mission is to seek fundamental knowledge about the nature and behavior of living systems and the application of that knowledge to enhance health, lengthen life, and reduce illness and disability. NIH is part of the U.S. Department of Health and Human Services (HHS). Healthfinder, coordinated by the Office of Disease Prevention and Health Promotion, part of HHS, provides resources on a wide range of health topics, selected from approximately 1,400 government and nonprofit organizations. RePORTER includes information on research projects funded by NIH as well as CDC, the Agency for Healthcare Research and Quality, the Health Resources and Services Administration, SAMHSA, and the U.S. Department of Veterans Affairs. RePORTER also includes links to publications and patents citing support from these projects. Project results can be filtered according to specific parameters, such as research topic, principal investigator, fiscal year, keyword, etc. Note: when doing a "Text Search" to filter by certain keywords, you will have to read the description of each study to determine if that research is actually focusing on your keyword of interest. In some cases, the term may be merely mentioned in the grant application but is not the topic of the study. NLM is the world's largest biomedical library. It maintains and makes available a vast print collection and produces electronic information resources on a wide range of topics that are searched billions of times each year by millions of people around the globe. NLM sponsors MedlinePlus, a source of up-to-date, quality healthcare information from NIH. ClinicalTrials.gov, maintained by NLM, lists publicly and privately supported clinical studies of human participants conducted around the world. ClinicalTrials.gov does not contain all the clinical studies conducted in the United States because not all studies are required by law to be registered (for example, observational studies and trials that do not study a drug, biologic, or device). OWH provides up-to-date health information on women's health topics that range from reproductive health to healthy aging. The site provides easy-to-understand health information, daily announcements, links to thousands of free health publications and websites, and statistics on women's health. OAH is dedicated to improving the health and healthy development of America’s teens, especially those who are most vulnerable. HIV.gov works to expand the visibility of timely and relevant federal HIV policies, programs, and resources to the American public by increasing the use of new media tools by government, minority-serving organizations, and other community partners to extend the reach of HIV programs to communities at greatest risk.